Arsenic poisoning affects some 100 million people worldwide. The problem is greatest in Bangladesh, one of the world's poorest countries. One well in four contains arsenic levels above the World Health Organisation's (WHO) recommended guidelines, however, the geographical distribution is completely arbitrary. One well in a village could be clean, while another could be heavily contaminated. Efforts taken by various organisations to mitigate the damage are ineffectual due to the immense scale of the problem. There are over 10 million wells that need to be tested at least twice a year. Even filtration systems need to be periodically tested to maintain reliability. The long-term effects of arsenic poisoning are severe with 1% of the affected population developing cancers of the skin, kidney and bladder. The current field technology, the Gutzeit method, is a chemical assay. The reagents used are harmful (and include mercury as a by-product), hence tests need to be conducted by a qualified field technician in order to safely produce reliable and accurate results. When conducted optimally, the lower limit of the sensitivity is 50 ppb, which is the WHO guideline maximum concentration, but the assay still reports roughly 33% of tests as false negatives. In the 10 weeks of the IGEM competition, we designed and modelled the following arsenic biosensor system based on the Escherichia coli bacterium (see Figure 1). Schematic diagram showing the control structure of the As (arsenic) design biosensor. The first operon produces a high pH output in the absence of arsenate or arsenite ions. The second operon has a high binding affinity arsR promoter and responds to a low concentration of arsenate/ite. The final operon has a low affinity, high concentration arsD promoter, which responds to a high concentration of arsenate/ite (>50 ppb). The biosensor system was successfully modelled and the initial work begun to test the constructs, however due to the short timeframe of the competition this work was not completed. The following simplified biosensor part was designed and built as a proof of concept to substantiate the successful operation of the device (see Figure 2). Schematic diagram of the as implemented "proof-of-concept" arsenic biosensor device. The first part is the arsenic responsive promoter from E. coli. The ArsR gene and the LacZ operon were ligated into plasmid vector pSB1A2 and introduced into E. coli JM109. Once the arsR – lacZ construct had been assembled, we needed to characterise what we had built. This was done by adding decreasing concentrations of arsenic to drinking water and measuring the pH over time. 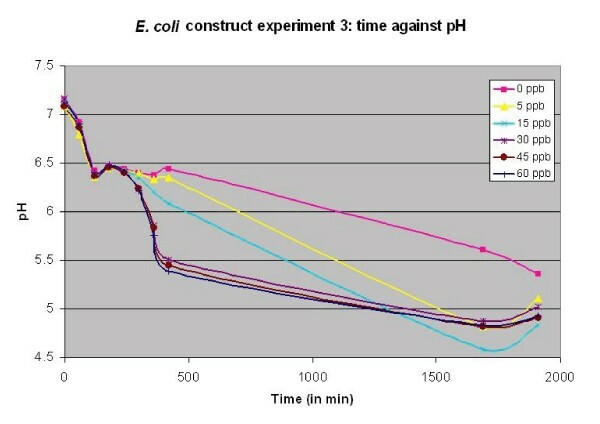 The graph (Figure 3) shows time against pH for our construct. The readings were taken every hour and the final readings were taken the following morning. A maximum difference of pH of 1.0 was achieved between the contaminated cultures and the control sample (with no arsenite) at ~500 minutes. Overnight incubation of E. coli with various concentrations or arsenite. In conclusion, we successfully designed and modelled the complex device. We proved a measurable pH response could be obtained with As concentration to WHO standards. We successfully biobricked a variety of parts and submitted them to the Registry of Standard Biological Parts at MIT. We feel that with further work, our device could potentially help millions worldwide.